Flt/Lt John Dundas, having already notched up eleven victories to his name during the Battle of Britain 1940, is viewed out on the last patrol of the day off the Isle of Wight. In a few moments he will be heading back to his base at Middle Wallop. Days later, John Dundas shot down the then leading German air-ace, Major Helmut Wick. Sadly Dundas, in turn, lost his life to Wick's wingman. He had fought with bravery but like so many of 'the few' he paid the ultimate price, fighting for our freedom. 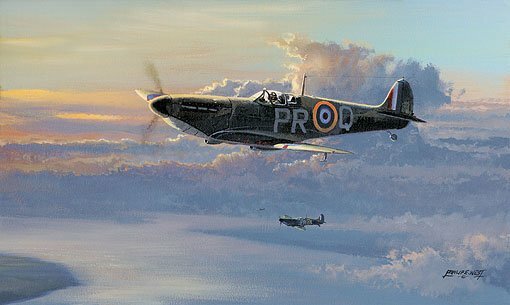 Primary edition prints are signed by a Spitfire pilot. Artist Proofs and Remarques are signed by two pilots. Flight Lieutenant Newman left O.T.U. to join 131 Squadron at Tangmere in time to participate in the closing months of the Battle of Britain. As the enemy activity diminished so the policy of Fighter Command turned to offensive sweeps over western France. By the end of 1942 the A.O.C decided to give the squadrons of 11 Group a rest from their intensive operations, so 131 Squadron was posted to northern Scotland to defend Scapa Flow naval base. This routine series of operations came to an end when Frank was chosen, together with a number of other experienced pilots, to form a fighter wing for the invasion of North Africa. My mid-1943 Rommel and the African Corps had been swept out of Algeria and Tunisia by General Montgomery and the Eighth Army. After a short rest the Desert Air Force was heavily engaged in the invasion of Sicily and Italy. By this time Frank was transferred to join the already famous 92 Squadron where he was pleased to come under the command of such experienced pilots as Group Captain Brian Kingcome and Squadron Leader Neville Duke. For the next few months 92 Squadron was heavily involved in a twice-weekly patrol over the Anzio Bridgehead where they occasionally met small units of the Luftwaffe. It was at this point that the squadron was hoping to score its 300th enemy aircraft destroyed. This happened on the 17th February 1944 and it was time for a squadron celebration! The enemy continued to appear in small numbers and later in the year whilst leading a dusk patrol Frank Newman and his fellow pilots were able to add to this score so that by the end of the campaign the total score reached 317½ definitely destroyed and over 200 probably destroyed. Any further increase in this number of victories was made impossible when the squadron was switched to fighter/bombers in late 1944; for this, tactics were so different. Each Spitfire carried a 500lb bomb and was given a map reference for his target by the army ground force. After the war Fl. Lt. Newman was sent on a training course to be become a Test Pilot. Upon completion of the course he was appointed Test Pilot at the R.A.F.’s biggest maintenance units (132 M.U.) where he enjoyed the privilege of flying thirty-one different types of aircraft. Flight Lieutenant R G (Bob) Large, DFC, Legion d’Honneur, learned to fly in Scotland in 1940 and in 1941 joined 616 Squadron as part of the Tangmere Wing, commanded by the famous legless pilot Wing Commander Douglas Bader. The Squadron flew Fighter and Bomber sweeps over Northern France. The remains of Bob‟s Spitfire lie at the bottom of the sea ten miles off Hythe (where he now lives) after being bounced by eighty plus ME 109Gs over the English Channel. Having learned of the activities of 161 SD Squadron he was interviewed by the CO, Wing Commander Lewis Hodges, and joined the Lysander Flight. He then flew many important missions into occupied France in single, double and a memorable treble pickup when his excuse for being late at the rendezvous was that he had had a haircut “in the firm’s time” because “it grew in the firm’s time”! After D-Day he returned to Fighter Command and later flew Meteors. Bob‟s dog, Patrick, became the first dog in the Allied Forces to fly in a jet which took place in a Meteor 3 on 11th May 1946 and is now recorded in the Guinness Book of Records!